One of the things I learnt over the years, is that a good scale is an essential tool for knitters. Even more if you’re a knitting designer or pattern tester! Each and every time I’m writing a pattern, I oblige to my weighting routine. Working with leftovers make it even more crucial that usual. To know how much yarn you used, you have two options: either measuring the length or the weight of it as manufacturers usually add the length per 100 or 50 g on the yarn band. And man, putting a yarn cake on a scale is so much easier than measuring the length of a full skein! Luckily for us designers, spreadsheets always save the day and converting grams into meters and yards for every yarns and every sizes of a pattern can be achieved pretty quickly nowadays. 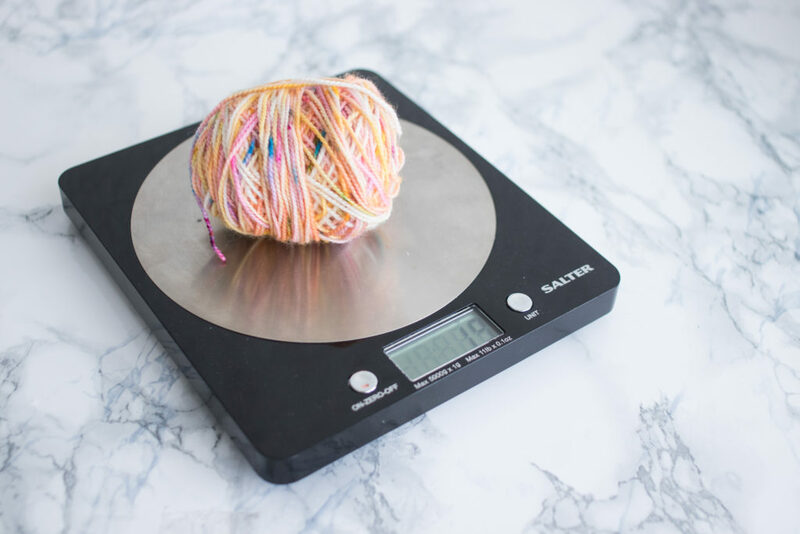 When buying yarn be sure to check the length and weight of yarn needed instead of the number of skeins as you might not need the same number of balls / skeins that indicated in the pattern if yours has a different yardage.